"Introducing Aristotle" guides the reader through an explosion of theories, from the establishment of systematic logic to the earliest rules of science. Aristotle's authority extended beyond his own lifetime to influence fundamentally Islamic philosophy and medieval scholasticism. For fifteen centuries, he remained the paradigm of knowledge itself. But can Aristotelian realism still be used to underpin our conception of the world today? Rupert Woodfin was a lecturer in Philosophy. Judy Groves is an acclaimed illustrator and graphic artist. 5.0 out of 5 starsAn excellent illustrated guide to Aristotle for anyone interested in this amazing philosopher. Philosophy has always fascinated me and over the years I have taken numerous philosophy courses and read countless books on this subject. My favorite ancient philosopher is Aristotle. I have read several graphic guide books lately and I purchased this volume (Introducing Aristotle: a graphic guide by Rupert Woodfin and Judy Groves) at a bargain price on Amazon. This 176 page paperback is surprisingly detailed on Aristotle’s life and his various approaches to philosophical issues. This excellent book covers the early education of Aristotle, his joining Plato’s school and how his ideas were different than Plato. He is probably most famous for being Alexander the great’s teacher. His brilliant mind explored a wide range of topics and is often credited with discoveries in literature, poetry, metaphysics, logic, mathematics and science. He turned out to not always be right when it came to many scientific issues; nevertheless, his contribution to knowledge is recognized in spite of the fact most of his writings have been lost to time. Where Plato's views bordered on the mystical and the elitist politically, Aristotle's philosophy emphasized reason, logic and individualism. 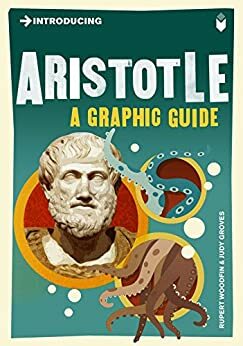 If you are seeking a concise but also detailed basic overview of the great philosopher Aristotle you might want to get a copy of this illustrated guide. Rating: 5 Stars. Joseph J. Truncale (Author: Never trust a politician: A critical review of politics and politicians). It's important to understand that the Introducing series is in the business not of teaching you the entirety of any given subject, but merely introducing you to it. This, as with many other titles in the series, gives you a very quick summary of the movement and its history and touches on many of the significant branches. Believe me, you can always go deeper, and really one ought to if one desires anything close to an actual understanding of the subjects the people at Totem Books purport to introduce. What I find is that these books in general, and this title specifically, prepares your for deeper reading by giving you the gist of things, and thus allows you to engage other texts with greater sustain and keener acumen. There are other series of course, Cambridge has their wonderful, if frequently denser, Companion series, and Paul Strathern has made his career giving a similar gist in 90 minutes. I would say that the people at Totem have hit the so-called sweet spot with these though. Strathern is too often concerned with biographical detail for my tastes, and spends less time with the ideas themselves (though of course the life of a thinker is important to understanding them. Cambridge has wonderful guides, but even these may be a tad much for someone merely seeking to dip their toe in and take a look around. This is why I recommend this series. The graphic approach hopefully renders these concepts more accessible to a wider audience, and can indeed make what are often thought of as dull subjects, quite entertaining. 3.0 out of 5 starsBad binding. Was Aristotle actually this ugly? I have a number of these books. They're very good to read when I can't pay attention to an actual book. Unfortunately the publisher is not applying much quality control as you can see from the books binding in the photo. Also you will see that the illustrations are not very good, almost embarrassing when I notice others peering over my shoulder :-) Fortunately the illustrator for this book is not the illustrator for other books in this series. I gave it three stars because the information sans illustration is actually interesting. This graphic novel series is wonderfully done. Great for adults who just want a refresher or a great way to get kids interested in these usually profound subjects.